This 9mm HST ammo by Federal is an excellent choice for personal defense and is a duty load that many police departments rely on. 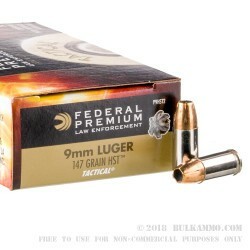 At 147 grains, this standard pressure 9mm HST ammo performs very well in the FBI test protocols expanding to roughly twice its original size into six petals even through the denim barrier test and generally penetrates within the 12-18" goal. This ammo performs well even through the auto safety glass test retaining close to 90% of its weight which is very impressive and is pretty close to the performance you see out of bonded bullets such as Speer Gold Dot with the added benefit of greater expansion. 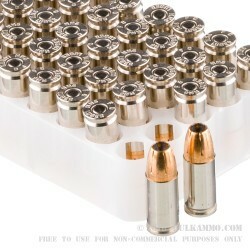 This ammo is generally considered subsonic and features nickel-plated cases that are boxer-primed and reloadable. Nickel plated cases have a lower friction coefficient than brass to ensure even better feeding than normal. This ammo is very well reputed and is an excellent choice for concealed carry in case your life is ever on the line.